All these must be taken into consideration. For an area of 2000 sq. with top quality paint, it may cost you $350.00 in paint alone. You can add about $250 for brushes and any other materials that may be required. 5. Plan A Schedule: Make sure you have a grip on the time and how long it would take you to complete the job. Do you have kids? It would be a nice idea to send the kids on an outing to the park or to their grandparents so you can concentrate on the job at hand. 6. Protect The Furniture: You cannot paint the house with the furniture exposed. There needs to be some protection for the furniture. They can be covered with polythene wrappers or cleared out entirely. This would allow for ample working space. 7. Prepare The House: Clean the walls and remove anything that would contaminate the paint. Cobwebs, wall papers, stickers and anything similar should be removed from the wall. Open the window to allow for cross ventilation. This makes the paint dry faster and promotes a healthy work environment. 8. Apply Prime: Dark walls, stained walls and walls which have not been previously painted would need priming before painting. This would enhance the appearance of the end result. However, not all surfaces need to be primed. Some can be painted without priming. The essence of priming is to equalize the wall to an even surface and acts as a foundation for the paint to be applied. 9. Start Painting: Start with the most difficult part, applying paint from the top to the bottom. It should be applied gradually with a brush. Look at how things turn out and adjust accordingly. With a few strokes, you will understand the application process. At the end of painting, make sure you clean the entire environment, removing and disposing all waste. Do not forget to reward yourself with a little refreshment as you have earned it. Thinking about changing the color of your living room? How about a color makeover for the bedroom? No matter what room of the house you are thinking about, the choice of color is important. That calming bedroom you always imagined could turn into a nightmare that won't end. Of the stunning entry way could be the eye sore of the neighborhood. Knowing a little bit about colors can help you choose the one just right for the look you are trying to achieve. The Color Wheel This is the most fundamental thing you need to know about colors. There are 2 basic groups of colors: warm and cool. Warm colors are red, yellow and orange. They are exciting colors, full of life and energy; think about fire with its glowing flames. Cool colors are more mellow, blues, greens and purples. Think of an outdoor scene, with green meadows and blue skies. The feel that you are looking for should lead you to one group of colors or the other. Color Harmony Putting just any old colors together can really be unpleasant to the eye. Color harmony is all about colors that go well together. The simplest way to think about this is when looking at a color wheel, colors that are adjacent to one another or directly across from one another compliment each other. Monochromatic color schemes work well too - where you have varying intensities of the same color. Where to start So now that you have the basics, think about the room you want to change. Would it be a place fo relaxation? Or a place for entertaining? You might think about shades of blue and green for a bedroom you can really relax in. Or shades of orange for the kitchen and dining room you love to entertain your guests in. And remember, when working with more vibrant colors, a little goes a long way. If you love the ides of red in your living room, stay away from painting the walls AND having your drapes and upholstery in shades of red. Pick one peice that will take on the spotlight, and accent that with other hues, tones, colors, etc. And now you can get small paint samples for cheap to bring home and try out. Feel free to experiment with how the colors you are thinking of would look together. What are you waiting for? Get colorful! Painting your home for staging purposes is a little different than painting your home for personal pleasure. While your daughter may love having her walls painted Barbie pink, a potential buyer may see this as a distraction. Choosing neutral colors will enable buyers to imagine themselves in your home much easier. 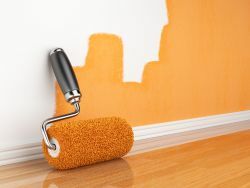 And while a fresh coat of paint on your walls may initially seem to be a costly endeavor to undertake, consider that painting your home can increase the value of your home by a few thousand dollars in some cases. Below is a basic guide to what colors you should have in mind if you plan on painting your home for show. The Kitchen - Kitchens do well with yellows, oranges, and reds. As long as the shade is neutral, these colors will serve to highlight home appliances, kitchen size, and overall comfort. Picking these food-friendly colors will definitely kick your kitchen up a notch. Bathrooms - Bathrooms, because of their size, are best served by very light colors such as tan or pale yellow. The darker you go, the smaller your bathroom will look. In addition, Light colors will also give a sense of cleanliness to a bathroom. If you happen to have a bathroom that already boasts a robust color due to architecture or tile, then pulling colors from these may be an option. For instance, if you have a tile floor in the bathroom with a blue or red in it, then drawing from these colors and choosing a paler shade for the walls could potentially work for the overall flow of the bathroom. Bedrooms - Bedrooms should always steer clear of bright colors, but other than that, you can have a bit more freedom here. Things to keep in mind include the color and style of flooring and fixtures, and whether or not your master bedroom has a master bathroom. Be sure to pick colors that compliment each other if so. Hallways and the rest - Again, you get a bit more freedom here. Salmon-hued paints have a tendency to make people look lively and energized, while beige and blue tones can convey a sense of tranquility and calm. Beige with green tones can be energizing, so it may be something to consider once you reach the living room. Bright reds should probably be avoided in hallways, as they have a tendency to keep people from fully relaxing. This may sound a little crazy, but it's true.